We offer Self learning kit for most of the latest microcontrollers. We offer PIC Self Learning Kits that enable enthusiasts to learn about microcontrollers within the comfort of their homes. The kit comprises of all the standard pieces required for hassle free learning. These are provided with a detailed instruction manual which eases the learning process. All the pieces have been designed under the close supervision of our experts and with the use of advanced techniques. Clients can avail from us a wide range of Arduino Self Learning Kits, as we are engaged in manufacturing these products in bulk. We are a renowned name in the market offering AVR Self Learning Kits. These kits have been designed keeping in mind all the needs of our customers who want to learn the microcontroller systems. All the pieces of this kit have been designed using advanced technology and high grade raw materials. This is a comprehensive kit comprising of all the required pieces. We make this available at market leading prices. 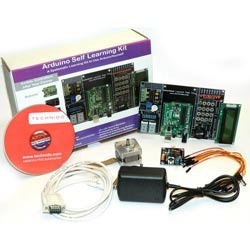 We offer Atmel Self Learning Kit which is a comprehensive set that eases the learning process. It comprises of several components that have been manufactured using optimum quality materials sourced from the most credible vendors who have been associated with us for a long time. This is a standard kit which can even be customized depending upon the requirements of our customers. This has been duly tested before being made available to our customers.